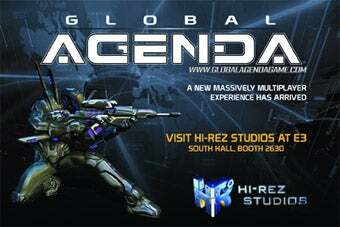 Hi-Rez Studios is heading to E3 2009, yanking their action-oriented massively multiplayer game Global Agenda away from alpha testers long enough to give the convention going public a little taste. E3 2009 will mark the first major public showing of the game, which has until now been shown off at the odd public charity event or via press appointments. This means a much larger audience will be getting their first taste of the game's intriguing mix of team-based shooter, role-playing game, and territory control strategy. Hopefully they'll be better at it than I've historically been. "Global Agenda is very different than the typical MMO", said Todd Harris, Executive Producer. "The intense mission combat and team-based tactics are best experienced rather than merely explained. We're excited to bring Global Agenda to the show for hands-on demonstrations, accompanied by one-on-one conversations with members of the game development team." He makes a very good point. I've tried explaining it many times myself, with varying degrees of effectiveness. Visit the Global Agenda website to check out the latest videos and screens from the game, which should do a much better job.